From a recent conversation with a customer, I noticed even some of the experienced DBAs are not very clear about the terms “unallocated space” and “unused space” and by doing a quick Bing search, found there are many SQL friends out there trying to get a clear correlation between these SQL Server terms: unallocated space, unused space, and reserved. Today, let us try to get a clear picture (infact, a picture!) of these terms using sp_spaceused system stored procedure and at the same time understanding results for database size information. We now know what these columns are and the numbers they are returning. But, here is the real confusion part: How are they correlated with each other? To cross verify, we can substitute the result set we got from AdventureWorks2012 database in the above formula and confirm by checking the log file size. Alternatevely, we can calculate the log file size, which is not returned from the ‘sp_spaceused’ result set. Excellent description and a great graphic. so what? how is unallocated space related to the Db size? 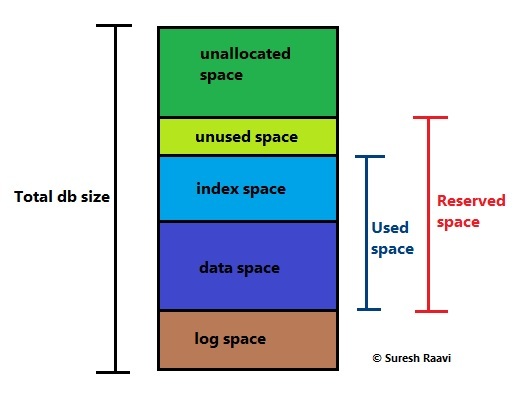 @sql – Unallocated space considered part of total db size. Thanks! So in this instance total db size in not the entire capacity of the database eg if we were using SQL express 2005 we’d have a 4GB capacity we would still have 3.8GB of space to use? Am I correct in saying this? And why even mention unallocated or unused space. What is the unused space reserved for? Great post though, the best I could find! Very nice article.Thanks for sharring the information. Sorry, you have conflicting and inaccurate statements in your article. This just adds to the general confusion out there. The graphical diag is accurate enough, but your ‘yellow dot’ bullet points above it are not. @Mark – what exactly do you mean by ‘yellow dot’ … troll? Was looking at shrinking my database file(test Server)and came across your wonderful explanation. Thank you! SO When I do a dbcc shrinkfile , is it the Unused space or the unallocated space that gets released back to the OS? or am I missing something here? Oh Another question also would be how does the space get marked when I drop indexes on a Hugeee table and and also truncate that table? (data+index is 170GB) .– where does this space go?? @GK You are correct! thank you for the catch, updated the post. Great article. There is a Currently Allocated Space text box on Shrink File window, how do we understand that? It looks always equal to the file size which may be a little conflicted to the explanation of “unallocated”. Since allocated is the whole file but unallocated is part of the file and we can not say allocated + unallocated = file size(allocated). Waiting 5 years to find this! Thankyou!